I slept in a bit this morning (7:30, yay!) but had enough time to turn on the coffee and put my breakfast casserole in the oven before grabbing a shower. Kids planned to wake by 10 AM so I could enjoy the peacefulness of the morning. Once they both came downstairs around 10, it was time to pass out presents! Presents for them and presents for me! 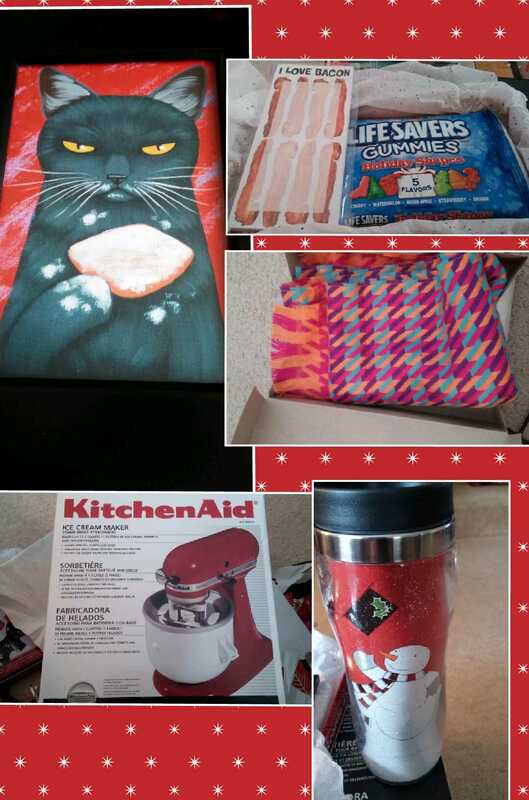 In addition to the items in the picture, I also received a few gift cards (Amazon, Macy’s, and Starbucks!) and a nice gift check! I’m already researching ellipticals on Amazon and the gift check will get tucked away for my cruise in February. I’m looking forward to testing out the ice cream maker for my KitchenAid. Can you say Ice Cream Par-tay?! I texted the ex to tell him that I’d like to watch Social Diva open her present since it was a joint gift. He was actually receptive to bringing it over here for her to open in front of both us. She was pleased (and I can’t wait to play with her new camera). Vampire Boy’s gift was an easy transfer of cash from my bank account to his. They also had a few things in their stockings as well. After the kids left, I resumed my Christmas Day tradition of seeing a movie, American Hustle. I made myself a nice Christmas dinner and have enjoyed a quiet house to myself. There were no drinking plans for the evening, so it will be two Christmases in a row where I will wake up hangover free. I’m both happy and sad about this. Now the question is do I want to go out shopping tomorrow morning? Hope you had an enjoyable day! Posted on December 25, 2013, in Family, Holidays. Bookmark the permalink. Leave a comment.